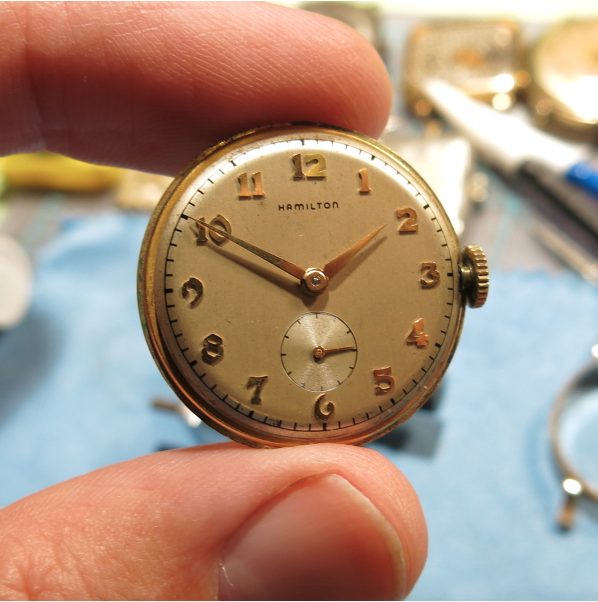 Watches in the 1940's are often surprisingly small. I guess the "greatest generation" and their parents weren't as self conscious as today's tuna-can wearing bling enthusiasts sometimes appear to be. The styles back then were more subtle but, to be honest, maybe a little too subtle in some cases - as there were some really small watches back then. However, there are exceptions to every rule and the 1948 Neil is one of them. 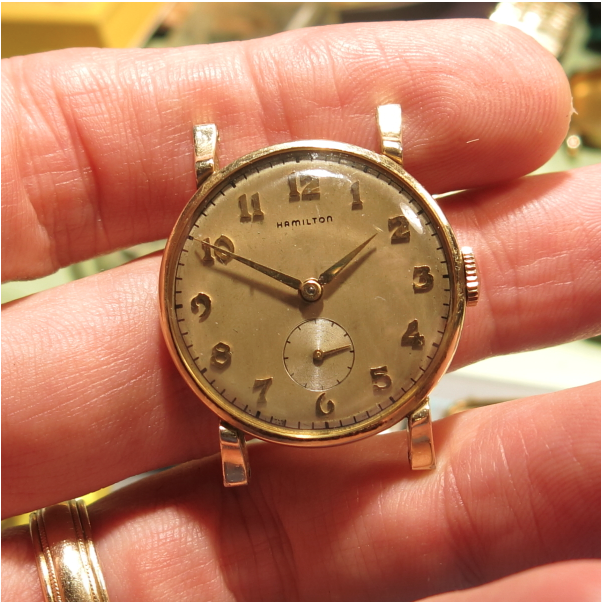 At about 30mm wide, it has a larger wrist presence than pretty much any other model in the 1940's. It was a popular model too - as it was produced for five years. The Neil uses Hamilton's 8/0 sized 747 movement which was introduced the prior year. 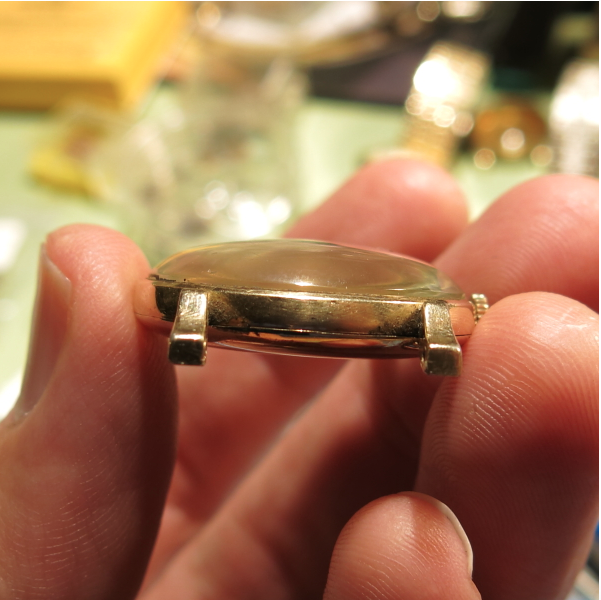 It's smaller than the 6/0 sized 987A that it replaced and that might help create the illusion that it's larger than the typical watches from the period. The case is 14K gold filled and the butler-finished sterling silver dial features solid 18K gold numerals. 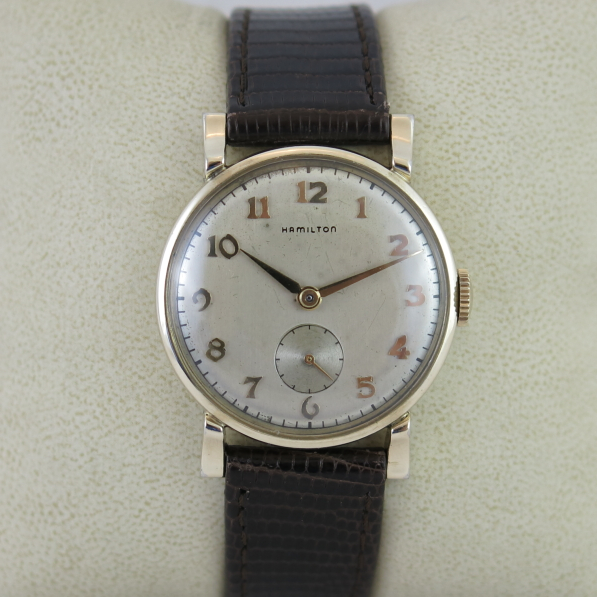 The Neil is also one of the first Hamilton's to feature a bracelet. Up until 1949 Hamilton predominantly used only straps. 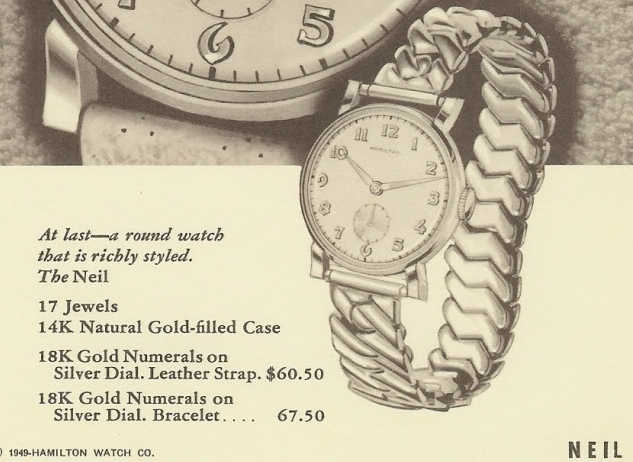 There are a number of models that received bracelets in 1949. The model is pretty popular, even today. I've wanted to get one for a long time but they usually sell for a price above my typical price for a project watch. However, I recently landed a nice example at a fair price. As you can see below, it was in decent shape. The model is prone to wear to the outside edges of the lugs and this one looks nice and crisp. The crystal on the watch is a high domed glass and actually gives the watch a slight goldfish bowl-effect. The prominent dome is probably one reason why the case is still in good shape. However, unfortunately by protecting the case, the crystal has taken some beatings and will need to be replaced. You really can't polish glass crystals like you can plastic. Below the crystal, the dial is original and shows a tiny bit of wear from age but overall still looks great. Here's a shot of the 747 movement. It's a little hard to tell in the photo, but there's a coating of oil on everything. I'm not sure what that's all about but the watch does run - which is a good sign. 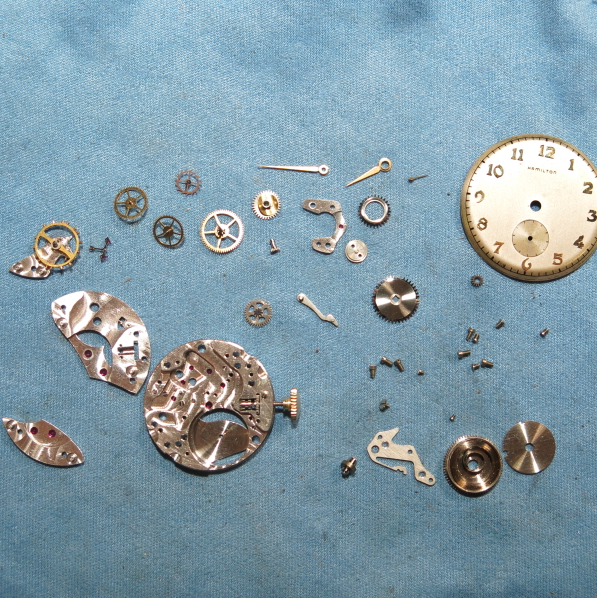 A thorough cleaning will get it back into proper condition. Everything gets taken apart and cleaned up. As you can see below, a good cleaning makes everything sparkle like new again. A fresh mainspring is installed in the barrel and you can see it in the lower right corner since the cover hasn't been put on yet. 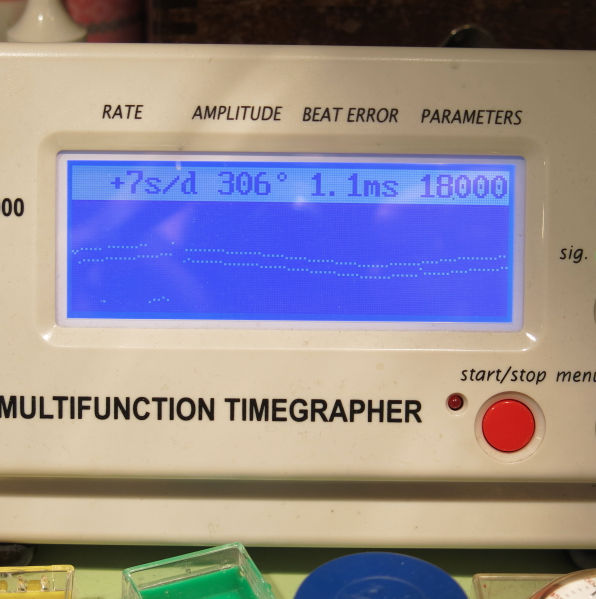 In this shot you can see the effects of my tweaking the regulator to adjust the time keeping. It eventually leveled out at about 7 seconds per day fast. 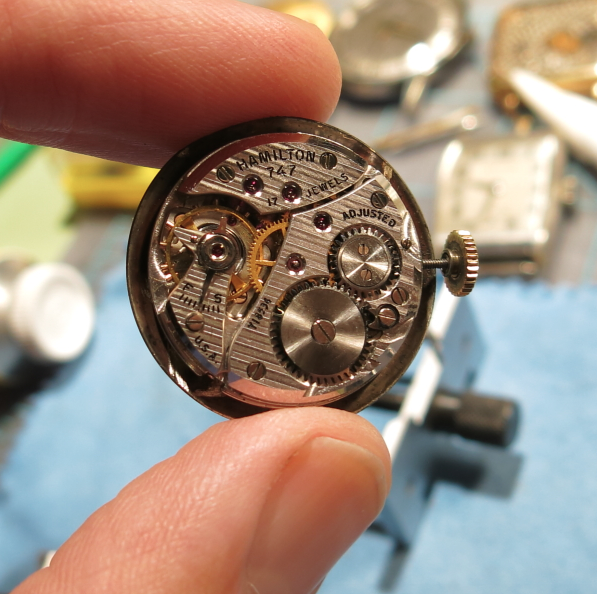 I usually try to set it around there as it will slow slightly as the mainspring unwinds. And here is the finished product, all polished up with a fresh glass crystal and a nice genuine lizard strap. This watch's simple design makes it a sharp looking watch in my opinion. This clean, elegant look is still being replicated today by modern manufactures, 60 years later. 'today's tuna-can wearing bling enthusiasts' - that cracked me up! Sad but true. Very smart Neil, thanks for sharing as always.